When watermelon is placed under vacuum the air expands and the liquid in the cells rapidly reaches boiling point. This ruptures the cell walls of the fruit so that when the pressure is returned to normal, the cells collapse. This results in a much denser piece of fruit with a translucent appearance which had been favoured by chefs in recent years. It is worth noting that this technique can only be done by a machine with a vacuum chamber, not a bar sealer. For a sweeter result, add a tablespoon of sugar syrup to the bag. You could also add a few mint leaves for a really fresh taste. 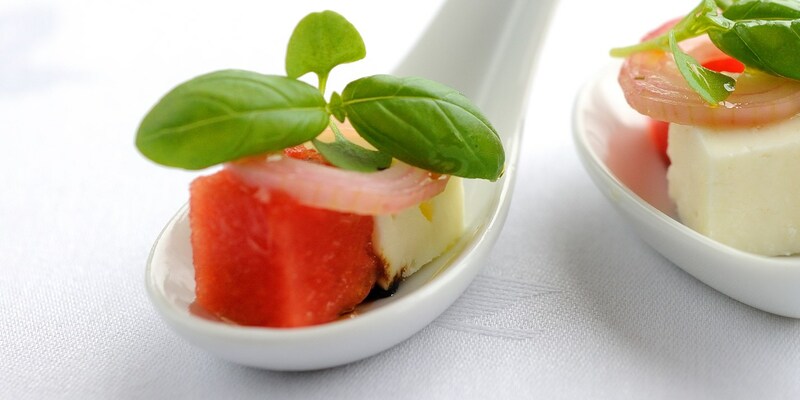 Compressed watermelon lends itself to both savoury dishes such as Kevin Mangoelles’ Mackerel with compressed watermelon, with a crab and horseradish salad or Simon Hulstone’s Crab and watermelon, and sweet – try Tom Aikens’ Compressed watermelon with coconut sorbet.